We're delighted to have KaeLyn Rich with us to share more about her debut novel, GIRLS RESIST! : A GUIDE TO ACTIVISM, LEADERSHIP, AND STARTING A REVOLUTION. KaeLyn, what was your inspiration for writing GIRLS RESIST!? I've been involved in student activism and young adult activism since I was, myself, a student and young adult. It started from this place of just being sad and mad about the unfairness in the world we live in. I grew up with parents who were union members and educators and I saw them taking action in our community from an early age. As I got older and more passionate about my activism, I read up on community organizing theory and tactics. There are several excellent classic and contemporary books on the subject out there. However, there aren't a lot of books written by women or written for girls. I'm inspired by the teen girl and young girl activists who have existed, literally, throughout history, at the front of our movements. I'm inspired by the youth organizers of this generation who led #BlackLivesMatter and the National Walkout across the country. This book is about supporting those movements with info young activists need to take their work to the next level, the information I wish someone had put in my hands when I was a young woman. How long did you work on GIRLS RESIST!? I need to start by saying this is my first published book, ever. My editor and agent assure me this process for writing a book is unusual. The total length of time from the moment of conception around the idea for the book to holding it in my hands was less than one year. I wrote the whole book cover-to-cover in about three months. I set out to write a handbook, a typical guidebook that is written without a narrative voice. About halfway through the writing process, while going over the manuscript with my editor and a friend I asked to be a reader, we realized that the book needed to have "me" in. Organizing is personal for me and feminism is personal for me and trying to write as though it wasn't just didn't work for this book. This book is a conversation between me and other activists, between me as a woman and teen girls as young women. Like the 1960's feminist saying goes, "The personal is political" and I learned that about my writing process through this book. What do you hope readers will take away from GIRLS RESIST? I hope readers open the book and find the tools they need to take the next step in their activism, to ignite groundbreaking, historic revolutions as well as intimate, vital moments of resistance. I hope readers feel seen and heard in these pages. I hope they can feel my love for them and their activist work through my words. I hope they take away the really specific strategies and tactics and skills that are the foundation of Girls Resist! as well as a renewed sense of empowerment to lead us all into a better future. My whole life, I thought I would write a book one day. Like, literally since I was four-years-old, I wanted to be an author. I went to college for creative writing (poetry and fiction). However, my life path bent and turned in another direction and I'd mostly decided that writing was a hobby and a skillset for me, not a job. I dabbled in writing for work, stuff like newsletter content and fundraising letters and I even penned a local sexual health column for a couple years. I never planned to go back to that dream of becoming a capital "W" Writer, though. In 2014, on a whim, I applied for a freelance position as a staff writer for Autostraddle, a prominent queer blog. I started blogging for Autostraddle and it's actually through a column on community organizing that I was writing for the blog that Quirk Books (my publisher) found me. When I was approached about the Girls Resist! project, I was completely surprised. Now that I've made it through my first book, that part of me that longs to write has been reignited. I'm already thinking about what my next book could be about and even flirting with the idea of getting back into writing fiction! All that to say, I wouldn't say my road was hard so much as twisty-turny! I get my best writing done when I'm out of the house, usually at a coffee shop. I listen to ambient mood music like Explosions in the Sky if I need inspiration or to energetic, beat-heavy music like rap, R&B, punk, or pop if I'm jamming along nicely. Just do the thing. I don't mean quit your day job (necessarily). But if you want to write, write. Start a blog. Pitch to a blog. Write your novel. Go to the open mic. Create the YouTube video. Send the query. Since I've been writing professionally, I've realized that most writers are like me--regular people who choose to write. A lot of them are also freelancers with a day job, like me, and there's nothing less cool about that! The path to authorship, for me, was all about allowing myself to choose writing without worrying too much about whether I'd ever "make it" or not. Lots of rumbly jumbly ideas that I'm trying to flesh out into real proposals if I'm honest with ya'! KaeLyn Rich is a queer feminist, a direct action organizer, a nonprofit leader, a word wrangler, and a sexuality educator. Her community organizing experience dates back to stuffing folders for her parents’ union meetings around the dining room table. She’s an adoptee immigrant from South Korea, a comfort food foodie, and a persistent devotee of the Oxford comma. She lives in Rochester, NY with her spouse, a baby T. rex, a xenophobic cat, and a rascally rabbit. 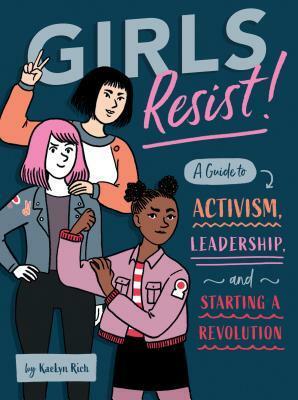 Have you had a chance to read GIRLS RESIST! : A GUIDE TO ACTIVISM, LEADERSHIP, AND STARTING A REVOLUTION yet? Are you getting out there and doing the thing? Are you choosing to write without worrying too much about if you'll make it? Share your thoughts about the interview in the comments!